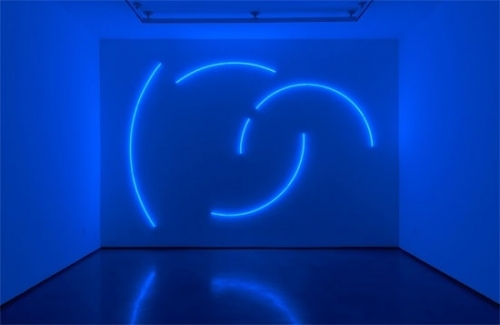 “Four Blue Incomplete Neon Circles” is an early example of the wall series produced by the late Stephen Antonakos from the mid-1970s. This piece was made for a breakthrough exhibition for the artist in Greece in 1977 and fortuitously fits perfectly the main wall of Lori Bookstein’s project room (all his wall pieces were at least initially site-specific). Deep blueness escaping that room in the back corner of the gallery seeps into the main space with its display of extended series of previously un-exhibited “cuts,” minimal works on paper in which line is described in neat incisions. Sometimes a chromatically saturated support holds razor thin lines of subtle reveal, while in others there is a white page on top with color peeping out from a second sheet beneath. In either event, while diagrammatically anticipating neon pieces these “cuts” form a scintillating constructivist experience in their own right.